A play cafe near Nantwich, which is designed around different role play areas. 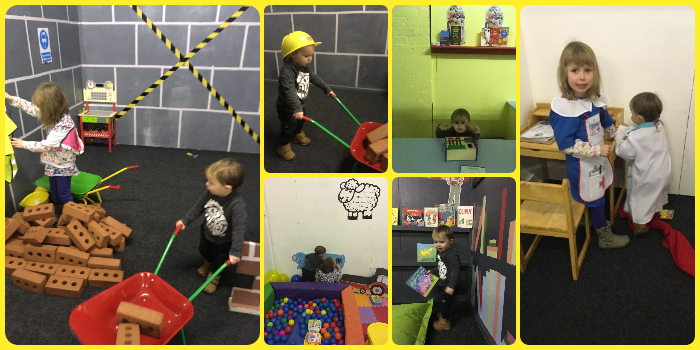 It makes such a great alternative to traditional soft play. 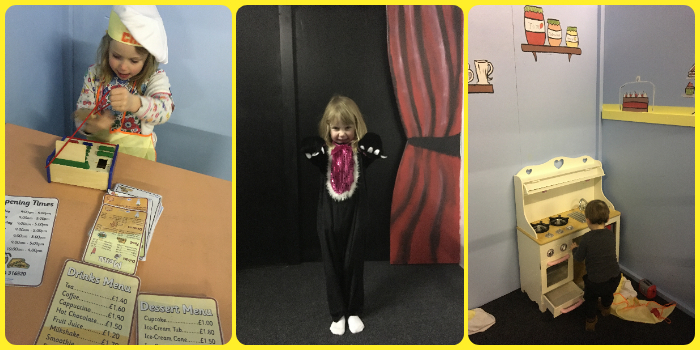 Recently I came across details of Imagination Lane and thought it looked fun so took the kids. I think it has been open about a year - it certainly still feels quite fresh and new inside. The centre is designed like a street with a row of different role play areas along each side and then tables and seating down the middle. The role play areas were; doctors, cafe, library, car garage, builders' yard, supermarket and theatre. There is also a baby corner for the under 2s with a small ball pit and other baby toys. Miss A spent a lot of time in the theatre area trying on lots of different costumes. Master R predominantly spent his time either on the ride-ons or pushing a trolley or wheelbarrow around. We were there longer than I initially anticipated so we ordered food which was very reasonably priced. The service was a little slow but they were very busy and the kids were happy playing so didn't seem to notice the wait, it was just me who was anxious to eat! It did get very busy with everyone sharing tables and standing room only at one point so it's worth getting there early to bag a seat particularly if you are going to want to eat. Imagination Lane was very clean though a tad cold when we first arrived until the heating kicked in a bit more and there were a lot more bodies inside and then it really warmed up! You pay for entrance at the same till as you order food. It's a bit awkward and isn't ideal as people are trying to come in and there's a queue of people trying to order food. Imagination Lane isn't the easiest place to find. It's certainly tucked away on the trading estate. Turn left as you drive into the trading estate and park up. Then head towards the buildings at the end and there's a small sign that takes you to the right and through what just looks like a warehouse door. It was nice to take the kids to a play centre that wasn't the usual soft play. Imagination Lane was a safe environment to let them just wander between the different areas. It's a great find and I'm looking forward to taking the kids back again soon.